#1: What is a book writing coach? #2. What is the difference between an editor, a writing teacher, and a book writing coach? #3. I already have a critique group. Why do I need a book writing coach? #4. How do you help fiction writers avoid the feeling of overwhelm during story critiques? #5. I’m so tired of re-writing my book! How can I avoid revisions? #6. I’ve received so many contradictory opinions! How do I know which writing advice to follow? #7. Another writing professional told me that my revisions had made my story “stale.” How do I fix it? #8. How do you select writers for your Mentorship Program? #9. What do you expect from the fiction writers whom you coach? #10. What can I expect from story critiques? #11. As my book writing coach, will you edit my story for me? #12. What can I expect during a fiction coaching session by telephone? #13. What is your fee as a book writing coach? #14. How do I apply for your story critiques and private coaching? What are your current rates? An editor is helpful if you have not mastered English punctuation and grammar; if your writing does not convey ideas in a coherent or logical manner; if the story progression is hard to understand; if the pace is bogged down by long passages of narration; and if your passages are full of weak adjectives, passive verbs, clichés, etc. A writing teacher is someone who helps you learn the fundamentals of fiction / novel structure through class instruction, writing assignments, and suggestions for improvement. A book writing coach goes beyond writing teacher, because she not only instructs you in the foundations of fiction, she mentors you how to sell your book and how to market your novel after its publication. As your book writing coach, I start our relationship by helping you determine your strengths and areas for improvement. To do this, I evaluate the first 30 pages of your manuscript, and a synopsis, if you have one available. I mentor you as far as you are willing to go — through your first sale and beyond, if you choose. After your first sale, you will need to develop marketing strategies for your book, and you will need to develop the next fiction proposal that you would like to sell. But since you’ve brought up story critiques, let’s focus on the advantages of manuscript evaluation by your writing coach. Not all manuscript critics are created equal. Even published authors don’t always possess the skills to analyze somebody else’s fiction and offer constructive suggestions that will save problem writing from the chopping block. Sadly, I’ve encountered aspiring authors who’ve revised the same manuscript three or more times upon the (often vague) suggestions of published authors, literary agents, and book editors. Not only have these aspiring novelists grown disillusioned and defensive about story critiques, they’ve become bored with their book writing. Their manuscript has become homogenized and stale. As their frustration grows, their confidence dwindles, and they start to lose sight of their publishing dream. The purpose of a book writing coach is to help you rekindle your dream. I can put the comments of former critics in perspective, help you recognize and build upon your strengths, and motivate you to write books confidently. By prioritizing areas for you to improve, I can help you feel liberated from your sense of “critique overload.” My written comments will contain constructive criticisms. I do try to be gentle and encouraging, but after 20 years of working with fiction writers, I’ve learned that my methods aren’t for everyone. Evaluating another writer’s prose is a subjective proposition. I don’t claim to have all the answers. Nor do I promise to get you published. That’s your job. My job is to help you increase your writing confidence and find the courage to write your book to the end. I work with you to prepare a plan of action – one that is designed to heighten your sense of accomplishment as you watch your skills progress. As a book writing coach, I’ve found it helpful to prioritize areas of improvement for my clients. For instance, after reviewing your work, I might determine that a focus on characterization would serve you better than trying to tackle characterization, scene-and-sequel, pacing, dialogue, and novel structure all at the same time. We would then work together to develop a plan of action – one that gives you a sense of accomplishment as you see your book writing skills progress over time. As your book writing coach, my goal is for you to practice confident writing and achieve your publication dream. If you refuse to keep writing when the going gets tough, you will not become published. Accept now that 80% of your publishing career will be spent rewriting your manuscripts to strengthen word choices, fine-tune characterization, improve plots, and please editorial committees. Book editors often require a published author to rewrite scenes — or to slash entire chapters from a book — for a variety of business reasons, ranging from a bloated storyline to the price of paper. Revisions are just part of the business of writing. Story critiques should never belittle your ideas. Nor should they ever leave you feeling so hopeless about your skills that you discard your dream of becoming a published novelist. As your book writing coach, I shall do my best to help you put contradictory feedback into perspective so that you can look at the book you are writing with a fresh eye. My advice to writers is to follow your instincts. If my evaluation feels wrong because it’s detrimental to your vision of the story, then leave the passage intact. On the other hand, you may have to accept that additional practice in book writing is necessary before you can master the techniques that I recommend to fix a problematical passage. If you’ve re-written your fiction manuscript so many times that the story no longer feels alive; if the thought of revising those chapters makes you so angry that you want to cry; then do yourself a favor. Retire that story. In most writers’ lives, a time comes when he must accept that the book he is writing has become his best teacher. In other words, by revising your manuscript umpteen times, you have gone through the tedious self-study required to learn how to write a book. At this point, the healthiest thing you can do for your career is to sit down and write a fresh story. As your book writing coach, I can help you put into perspective what you’ve learned and help you apply those lessons in your next manuscript. My goal would be to help you devise a plot that is interesting for you to write, but to steer you away from storylines that are so complex, that they would frustrate you at this stage and prevent you from writing a book to completion. I look for fiction writers who are sincere in their determination to become published authors, who demonstrate their commitment to advancing their skills, and who have thoroughly researched their market so that they know which category of fiction (and its sub-genre) they want to write. In addition to your level of book writing commitment, I shall gauge our personal chemistry. I look for positive, upbeat personalities who are courteous, enthusiastic, and open-minded, who keep appointments and meet deadlines, who do not take offense easily, and who can listen calmly to constructive criticism without interruption, argument or debate. Since I speak only one language (English), my clients must demonstrate fluency in written and spoken English. Finally, I look for fiction writers who are ready to treat their book writing as a profession, rather than a hobby. I believe this attitude is essential to confident writing, and confident writing is essential for determining how soon you will sell your first book. Novel-writing isn’t a sprint, it’s a marathon. As your book writing coach, my job is to motivate you to stay on track with your publication goals; therefore, I shall hold you to a high standard. In other words, I shall expect you to commit to your publication dream by writing forward in your story for at least 2 consecutive hours every day. Studies have shown that the average creative writing student requires 2 hours to get his brain “in gear” for continuous composition. Anything less than two hours is more conducive to editing your story than composing it. If you lag behind in your writing assignments, or if you repeatedly miss our telephone appointments, there’s little that a book writing coach can do to help you. Telephone coaching requires a scheduling commitment from each of us. Because I, too, am a working writer, my time for one-on-one coaching is limited. Therefore, I choose my clients carefully, giving priority to those fiction writers who keep their commitments because they are burning to succeed. You can expect honest feedback from your book writing coach. After the application process is completed, I shall review the first chapter (up to 30 pages) of your fiction manuscript and a synopsis of your novel, if you have one available. I use these pages to evaluate your mastery of fiction writing and your knowledge of the category/sub-genre you are writing. Based on my review of these documents, I shall discuss with you your strengths as a fiction writer and (if appropriate) point out any genre roadblocks that might keep your story from being published. I’ll help you prioritize which foundation of fiction (characterization, plotting, dialogue, etc.) to concentrate upon to speed your path to publication. In the process of coaching you, I shall provide critiques of portions of your manuscript that you select to have workshopped. Typically, these passages will be the ones that frustrate you. They might also be passages that a liteary agent or book editor has described as roadblocks to your sale. When you’re ready to market, I’ll help you evaluate your query letter and synopsis for coherency and sales appeal. To help you master various “tools of the trade” that will fix the passages we are workshopping, I may engage in light edits, line-by-line. However, I limit these line-edits to 3 consecutive pages. This strategy empowers you to take a newly learned fiction tool and sculpt it with your own writing style throughout the remainder of your manuscript. My goal is to help you develop a discerning eye for good fiction writing and more importantly, to develop the self-discipline to practice good fiction writing, page after page. For that reason, I do not perform massive revisions via line edits. Line-editing is the equivalent of writing your book for you. #12. What can I expect during a fiction-coaching session by telephone? Most telephone mentoring sessions will involve some discussion of your writing progress. I can help you analyze a rejection letter or a contest commentary, so you have a second opinion before engaging in another round of edits. I can help you develop and rehearse story pitches for an upcoming appointment with a literary agent or book editor. If you prefer, we can brainstorm novel ideas; discuss techniques for confident writing; explore strategies for overcoming writer’s block; and develop time management plans. In addition, we can devise strategies for promoting your first sale, including publicity kits, news media interviews, public speaking engagements, and autograph sessions. In short, the telephone coaching session can be customized to meet your needs. I charge a professional fee for my services as a book writing coach and manuscript evaluator. My fee varies, depending on how many manuscript pages you would like evaluated and/or how many hours you commit to my Mentorship Program. My fee also depends on whether or not you are eligible for a student discount. A $25 non-refundable application fee is charged to review manuscripts. #14. How do I apply for your story critiques and private coaching? I accept a limited number of new fiction writers for my story critiques and private coaching each month. If you would like to be mentored, please review my current rate sheet and billing policies. The next step is to complete the fiction coaching application and email it to me, along with the first 10 pages of your manuscript (as described in the application) and your $25 application fee. Please allow 10 business days for me to review your documents. I shall notify you by email regarding the next step. 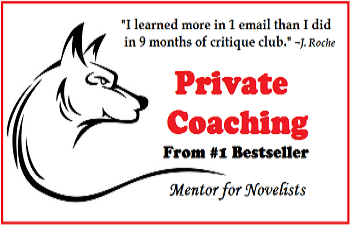 Thank you for your inquiry about my story critiques and private coaching. I wish you every success as you learn how to write a novel.